On the west coast of Portugal, where the Atlantic Ocean meets the mouth of the Lima River, lies the elegant seaside resort of Viana do Castelo. During the Age of Discovery in the 15th century, many epic voyages departed from its port, and the wealth that followed is reflected in the magnificent buildings you see today. The old quarter is still predominately a pedestrian zone. By wandering through the main square, Praca da Republica, or down the Rua Candido dos Reis or Rua de Sao Pedro, you will see the opulent mansions of days gone by. For a festival flavour, August is a good time to visit Viana do Castelo. As this is when they hold their annual Festival of Our Lady of Sorrows, with spectacular parades in regional dress, and folk dance with fireworks at night. 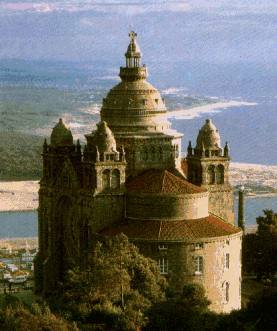 Set high in the hills overlooking the town is the basilica of Santa Luzia. Although the basilica only goes back a hundred years, the chapel within it dates back to the middle ages. Because there have been so many weddings and baptisms held in the chapel there is now a permanent flower display, which is well worth seeing. A winding staircase goes up to an observation platform where you can see incredible panoramic views. Thankfully for the less energetic or mobile, there is also an elevator . Located just behind the basilica is the Pousada Viana do Castelo (Hotel Monte de Santa Luzia), where you will find elegant, spacious accommodation that will make your visit a truly memorable one. There is no better recommendation than from National Geographic magazine, which describes the views from this hotel as one of the finest in the world. . 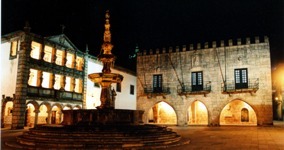 The Pousada was originally commissioned in 1903 by one of the town’s residents, who had made his fortune in Brazil. Later becoming one of the Pousada Group, it has recently been upgraded and is now one of the most charming Pousadas in Portugal. In the bar area is a large tapestry, which depicts the invasion of the Romans over two thousand years ago crossing the River Lima. Apparently, the Romans mistook it for the River Lethe, which they believed if crossed you would lose your memory. The soldiers therefore hesitated. In the end their leader had to cross the river himself and call each one of them over by name to disprove the myth . The sandy beaches of Cabedelo are only a short ferry ride away, and if you wish to do something more active, there are also bicycle tours, water sports and canoeing nearby, as well as golf at the superb Ponte de Lima golf course. You are also not very far from the world heritage site of Guimaraes, Braga, and the walled town of Valenca, all of which would make a marvellous day trips. For those who love nature parks, there is also Portugal’s only National Park, the Peneda Geres. There is no doubt you will easily fill a whole week if you came to visit Viana do Castelo. However, as the nearest airport is only 30 minutes away in Porto, it is also a convenient destination for a short break.